Successfully Added Secret Agent Pen Camcorder - 1GB to your Shopping Cart. Get the mission completed with this awesome secret agent pen style video camcorder. 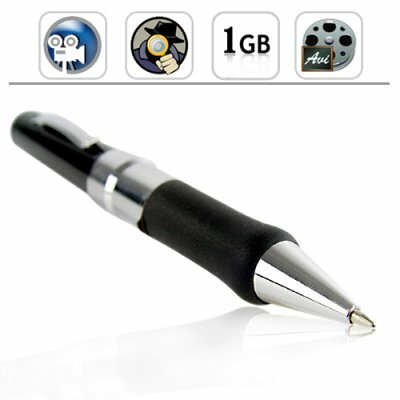 Designed as an attractive writing instrument with a gloss black finish on the main body with rubber finger grip, chrome detailing and along with 1GB of internal flash memory. Nobody will suspect that it is really a Secret Agent Pen Camcorder! This awesome surveillance gadget allows you to capture amazing surveillance footage while the pen sits in your shirt pocket, standing in the pen cup or lying on the desk, and no-one will ever notice as you secretly capture their every move. This hidden DV camera records video and face-to-face audio, so you can record video across the room as well as interpersonal communications without anyone knowing. The 1 GB of memory allows up to 3 hours of recording time to allow for plenty of surveillance time in the field. The color video is encoded on the fly through a buffer system to MPEG 4 so your video file is computer ready when you get back to the office, making it easy to transfer and backup the video files. Buy today at Chinavasion's factory direct wholesale price and use our industry leading QC, packing and shipping service to get it straight to your quickly with no hassle.